Partake in a unique sightseeing excursion with this delightful lunch cruise along the River Thames! See the best of London’s riverside attractions on a 1.5-hour roundtrip cruise from Tower Pier to Westminster. Stroll the deck, savor a delectable 2-course meal and admire great views of the London Eye, the Tower of London and more. An onboard bar offers additional drink options for spicing up your afternoon (own expense). Your luncheon cruise sets off from Tower Pier in central London at midday. Make your own way to the pier with plenty of time to board the boat and find your seat in the cozy, indoor saloon. Sit back and enjoy panoramic views of the city shoreline as your 1.5-hour cruise begins. Heading west from Tower Pier, you’ll first pass the formidable Tower of London, situated in the modern Square Mile, followed by The Shard. Also, know at The Shard of Glass, this 95-story pyramid dominates the South Bank skyline. Continue on to Shakespeare’s famous Globe Theatre, a historic active theater, and the enormous London Eye. Along the South Bank, witness the bustle of performers, locals and meandering tourists. Your cruise loops at Westminster, where you’ll get great views of the Houses of Parliament and the iconic Big Ben before turning around. As you cruise, indulge in a sumptuous 2-course meal featuring an entree and dessert with coffee and tea. For an added treat, purchase wine, beer or other non-alcoholic beverages from the onboard bar. 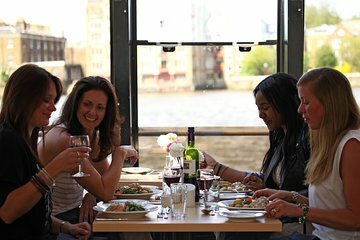 After lunch, get some air on the outside deck as your river cruise returns to Tower Pier. You'll arrive with plenty of time to continue sightseeing (and walk off your hearty meal)! Your seat on board is guaranteed and will be allocated to you before the cruise takes place. When you board you will be shown to your table. Please note tables are fixed and within close proximity. Our panoramic windows provide great views from all angles of the passing sky-line, regardless of your table location. We do not guarantee that products are free from nuts or traces of nuts. For gluten-free tea give at least 24 hours’ notice. For any special dietary requirements please call Reservations on 020 77 400 400 or e-mail to info@citycruises.com. It was raining but we were dry and had very good views of the city. It was VERY noisy (a boat full of talkers) so we could not hear most of the narrative so don't expect a good guide presentation. Food was very good. Everyone got the same thing...chicken. 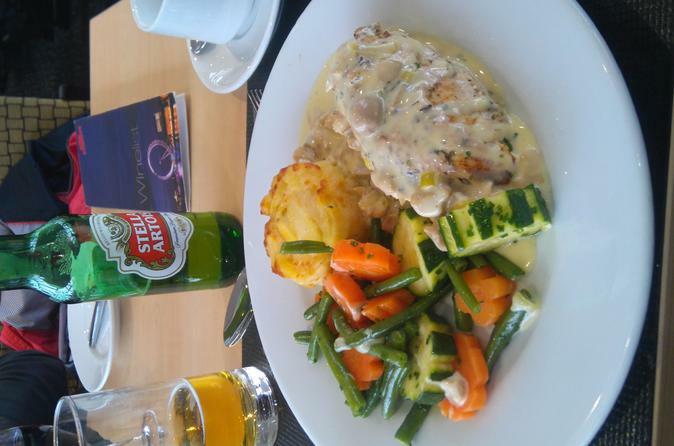 We enjoyed a tasty meal in the restaurant, with great river views. Then could sit up on deck, luckily the weather was perfect! The staff were smiling and helpful, the cruise ship spotless. The advance booking was so easy to do and the location was very easy to access and find. This short tour is ideal for an early lunch, leaving the afternoon for further sight-seeing, etc. It was so bad because of the customer service agent attitude has no skills of solving any issue which make decide that I will never book it again or recommend any one to try it . What a fabulous Thames Lunch Cruise. From the easy online reservation to the welcome we received boarding the boat. Once onboard we were assigned a table and because I had a dietary request, they made sure to confirm with me and then when the food came, I couldn't believe they I got what I asked for and the food was delicious. We saw so many sights going one way and then the other side when we came back. The crew and servers were so nice and very helpful. If you wanted an alcoholic drive, additional, cost, they had a full bar. I can't tell you how awesome this cruise was from the start to end. Thanks for letting me see all the amazing architecture and historical sights while enjoying a tasty meal. Highly recommend this and will do it again. The lunch cruise was a pleasant way to see some of the magnificent sites of London. We booked our trip the day prior, which meant our seat location was in the middle of the boat. So I would suggest you would probably get a better seat the earlier you book. That being said, our seat still gave a lovely view, and you could walk to the front of the vessel to take photos, or go on the deck upstairs. The food was very nice and a good experience overall. Great food and a lovely cruise. A different way to experience London. Great photo opportunities on this 2 hour cruise. We really enjoyed it. My only suggestion, soft music with the meal versus listening to the clanking of people's dishes or other tables conversations since seated so close. The best, however, more clarification on where this pier is. Our taxi driver took us to one pier and when he said down under we didn't realize that we had to take the tube to another pier. We literally had to run and if you were not able to you would have missed the boat. Got there with only a few minutes to spare. BUT the meal, the service, the servers and the views were great. Highly recommend.